What Are Your Marketing Capabilities? Use This Free Inbound Marketing White Paper To Be Sure Your Inbound Marketing Strategy Is Complete. A Website the passes the "usability" test? A well constructed blog strategy? An integrated social media strategy? A conversion strategy that is woven into all of the above? An accurate & usable evaluation process? This inbound marketing white paper will help you to create, develop and manage an effective, inbound marketing strategy. This no cost inbound marketing white paper will show you how to be certain all the elements below are considered, defined and included. More than 100 pages indexed by Google. Complete keyword research & strategy complete. Main pages optimized for the right keywords (SEO). Landing pages created on a regular basis & optimized for the right keywords (SEO). Significant quantity & quality of links coming from related websites. Regular blog posts developed to increase search opportunities and attract new links. Social media promotion and "reach" strategy created and applied. Lead conversion components created, in place, and being evaluated. Ability to identify who, where, when & why someone has visited your site pages. Ability to email leads that are segmented by message or offer. The "right" metrics so you can evaluate and modify on a daily, weekly & monthly schedule. Knowledge is power. The Virtual Support System inbound marketing white paper was created with this in mind. 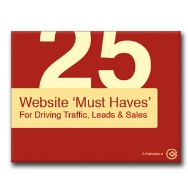 Click On This Image To Learn More About Driving Traffic & Converting Leads. © 2014 VIRTUAL SUPPORT SYSTEMS. All rights reserved.